Created by Vincent Sekwati Koko Mantsoe and Wesley Maherry, KonKoriti formed part of the Main programme of the 2017 National Arts Festival. The stage is bare except for five mike stands, some holding microphones. The opening hears people chatting before Mantsoe enters and solemnly and ceremoniously moves and repositions the mike stands. He stares at the audience as he walks past and his expression is difficult to read. Is he proud, egotistic or self-righteous? Or is he asking for help? The situation is enigmatic. 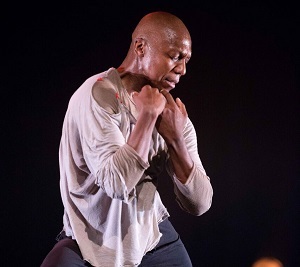 What is certainly not enigmatic is Mantsoe’s superb control of his body – the fluid strength and grace of the gentlest of movements can change in moments to powerful and frenzied activity without jarring. The lighting is extremely effective, sometimes highlighting the mike stands, giving them their own character. The soundtrack echoes the dancer’s moods, at one stage becoming so volcanic one expected the seating stands to start shaking! KonKoriti is named after a song about pride and arrogance that his grandmother used to sing to him and it explores physical power and selfishness. Mantsoe is strongly inspired by spirituality and deep cultural influences as he wrestles with the preservation of tradition in the contemporary. A former Standard Bank Young Artist, Mantsoe now lives in France. KonKoriti toured France and Germany last year to sold-out houses and critical acclaim.